This article is an update to the “Writing at Length” article published August 29, 2015. This is a very common question in the SEO world and the answer is simple: length of content absolutely matters in terms of ranking in search. The longer the article, the better. Now let me explain. There are several reasons why lengthy content will positively affect your website and if you would like help ranking in search, feel free to contact us at jwojdylo@gmail.com. While you may not initially write an article with keywords in mind, the longer your article is the more keywords that will be included in your writing. There are two types of keywords: Long-tail keywords and short-tail keywords. Long-tail keywords are phrases made up of five or more words and are very specific to a particular search. Short-tail keywords are used for general searches and typically have fewer than four words in the search phrase. Click-through rate (CTR) is the percentage of people that are clicking on a link in search for a given search query. The click-through rate of a website is a very important factor in SEO Google search rankings. The more your site is clicked on for a given search phrase, the more Google will recognize your website as a site of authority and the more likely it is that your rank in search will increase. The length of content affects the CTR because the longer an article is, the more long-tail keywords will be included, an therefore, more people will click on your site. This increases your click-through rate and, in turn, your rank in search. Another benefit to having, for instance, one long article rather than 10 shorter articles with the same content, is that your link portfolio will be stronger. A high number of backlinks to a single page is one of the single most important factors to ranking high in search. Therefore, if you write 10 articles rather than one, your link portfolio will be scattered instead of being strengthened by having all of those backlinks lead back to one place. 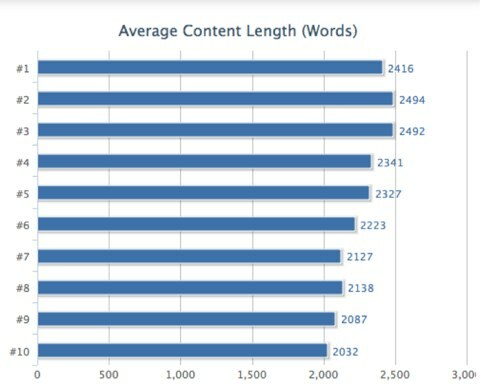 This picture shows, all other factors considered, the importance of length of content for articles that rank in the top 10 for a specific search query. While these numbers won’t be exactly the same for each query, we can assume that the shape of the graph itself will remain fairly similar. One argument against writing longer articles is that if an article is too long, users will not want to read all of the content (become overwhelmed), and click back to the search page. This click back action is measured as a percentage by Google and is known as the bounce-back rate. The truth is, when searching for a service, 99% of users will not read anything anyways, they are simply searching for a phone number or email address to get more information. Therefore, it is important to include your contact information in the first paragraph of content in any content-heavy article. Another argument is that several short articles that are more specific to a search query are more user-friendly than packing a lot of information into one long article. While some users may prefer several shorter articles, we believe that you may be doing the user a favor by allowing them to reach all the possible information on a topic on one web page, rather than several different pages. Don’t Keyword stuff! While long-articles are beneficial to you and your search traffic, it is obvious to Google when you are stuffing an article with keywords to gain traffic. This is also a punishable offense in the search world. Make sure that your inclusion of keywords in your article is natural. Quality content is more important than a large amount of low-quality content. While length of content is important, quality of content is more important and more directly influences rank in search. While the debate of length of content continues, I cannot stress enough importance of lengthy content at the start of a website for a business. Over time, if and when you gain authority in your field and become established as an expert to Google, it may not be as necessary to focus on the length of content being posted on your site. However, if you have recently created a website, we strongly suggest writing more lengthy articles to strengthen your website as you get started. If you or your company is looking to hire an expert in SEO that has the ability to help you write long, content-filled articles for your website to help you rank in search, please contact us at jwojdylo@gmail.com.